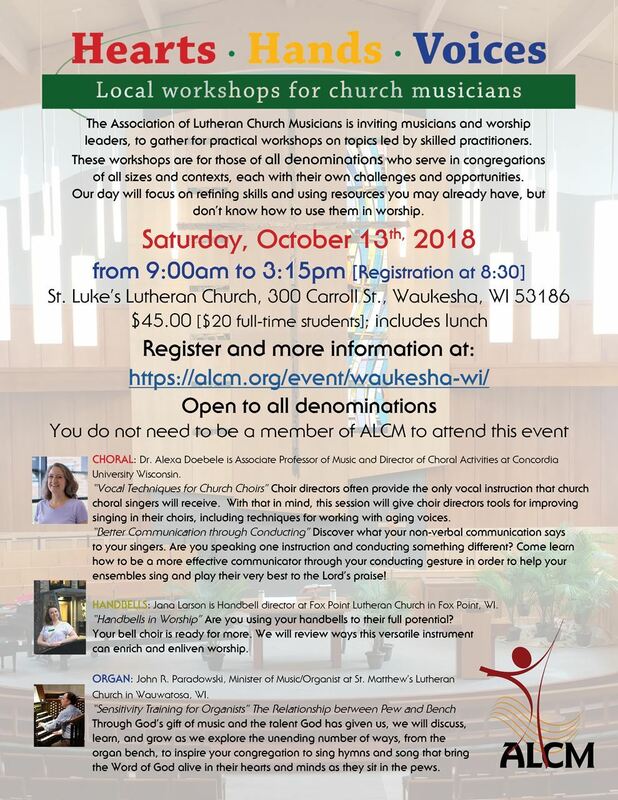 The Association of Lutheran Church Musicians is inviting musicians to gather in small groups at local congregations for practical workshops on specific topics led by a skilled practitioner. These workshops are for musicians in congregations of all sizes and contexts, each with their own challenges and opportunities. Open to all denominations. You do not need to be a member of ALCM to attend this event. Cost: $45.00 [$20 full-time students]; includes lunch. Dr. Alexa Doebele is associate professor of music and Director of Choral Activities at Concordia University Wisconsin, where she conducts three choirs, in addition to teaching undergraduate and graduate courses in music education, conducting, and choral literature. She is a frequent clinician, adjudicator, and guest conductor, and is active as an editor of choral music. Prior to her arrival in Wisconsin, Dr. Doebele recently served as the Director of Music at Holy Cross Lutheran Church in Wheat Ridge, Colorado. She is also active as both a solo and choral singer, most recently with Vox Antiqua, a newly-formed early music ensemble for which she is also the artistic director. She completed a bachelor’s degree (in vocal performance and German language and literature) at Washington University in St. Louis and her Master of Music Education and Doctor of Musical Arts degrees at the University of Colorado. Jana Larson has played handbells for twenty four years. She earned her Bachelor of Arts degree from St. Olaf College where she rang with Jill Mahr and turned her passion from ringing to directing. She has a Master of Church Music from Concordia University Wisconsin where she studied with Dr. John Behnke. In 2015, she served as the Interim Director of the Alleluia Ringers from Concordia University Wisconsin. Jana currently serves as Handbell Director at Fox Point Lutheran Church. She plays with the Milwaukee Handbell Ensemble and serves on the board as well. With MHE, she has presented concerts with the Milwaukee Symphony Orchestra and at the 2018 HMA National Seminar in Grand Rapids, MI. She has been a clinician, judge, and presenter at various workshops, conventions, and festivals. John Paradowski serves as Music Minister/Organist at St. Matthew’s Lutheran Church in Wauwatosa, WI, overseeing a wide range of worship and musical activities including graded vocal and handbell choirs. He has led sessions in creative church music, worship leading, hymn playing, hymnody, handbells in worship, and Organ, Choral and Handbell repertoire at national and local workshops and conferences. His music is published by Augsburg-Fortress, Choristers Guild, and Shawnee Press/Hal Leonard Publishing. He is a published author in the Augsburg Fortress “Sundays and Seasons” worship resource guide; in “Overtones,” the official journal of the Handbell Musicians of America; and in “The Chorister,” the journal for the Choristers Guild. Handbell Session - Handbells in Worship Are you using your handbells to their full potential? Your bell choir is ready for more. We will review ways this versatile instrument can enrich and enliven worship.